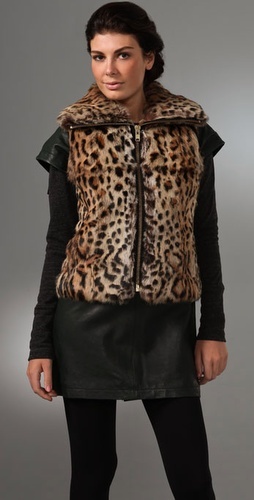 The Chic Leopard: in-VEST in this now ! in-VEST in this now ! Winter is my second favorite season because of coats, jackets, scarves, and VESTS ! My favorite is a vest because they are more versatile. They have no sleeves but still offer warmth. You can walk into a room and not have to remove it as you do a coat. Have you ever been wearing a coat so FLY, you don't want to take it off when you reach your destination? Fall in love with vests ! Here are some of my favorite leopard print vests found to date. I also hope it stays but the great thing about leopard print is that it's always in style, in my opinion. But yes, its a great thing that it's here in full force ! Thank you for visiting ! The last vest is so cute!! Alina, I think so too! But then again, I like them all. But if I could pick only one, it would be the third one. Thanks so much for visiting and commenting! Keri rocking leopard print in new video !